I just got back from Greece a week ago from celebrating my birthday. For a while now I had wanted to visit Mykonos island and finally made it happen with a short week long visit. It was my first time in Greece and I fell in love with it so bad! 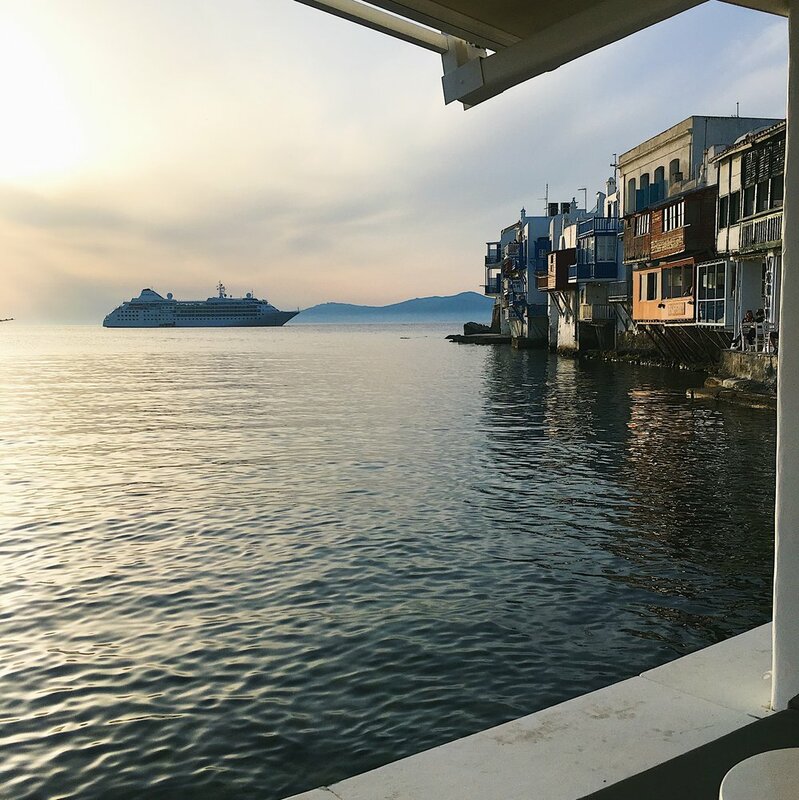 I took the ferry from Rafina to Mykonos that stopped in couple of other islands on it's way there and I was totally jetlagged during the ferry ride but the scenery was so breathtaking that I was able to overcome my anxiety of "Are we there yet?" haha. Our travel itinerary looked like this: We landed in Athens International Airport 2am and took the taxi to one of the ports, Rafina, from where our ferry to Mykonos was going to depart around 7am (Yes we kind of got bad luck with the flight and had to wait a few hours. Don't repeat that mistake, there is nothing to do at the Arrivals area of the Athens Airport). We ended up paying 50euros for the taxi, even if it was supposed to be much cheaper so keep on reading if you want to know how we only paid 25euros when returning a week later. I have to mention that when we went to Mykonos it was early May and the 'season' hadn't started yet so we might've avoided heavy crowds by doing that but also some businesses were still not open. So if you are looking for the beach parties, go during the season but if you don't need a party everyday everynight, then off-season might not be a bad idea. The island is so beautiful and there is still things to do and you just might have a little more privacy on the beach as well. You can either fly to Mykonos or go by water. We were not able to get reasonable flights directly to Mykonos so we decided to take the ferry. We used FastFerries, which takes 4-5h to get to the island but there is also ferries that get to the island in two hours but we were on a budget. Honestly, I did not mind the ferry at all. I was just laying on one of the couches in the lounge and sleeping through it so it worked out perfect. We did not pay extra for special seats because there shouldn't be an issue finding a comfortable spot. Different ferry companies operate from different ports but Rafina is closest to the Athens Airport. If you are spending some time in Athens, you might wanna travel via the Piraeus port as it is closer to the city. We had a driver picking us up from the port in Mykonos that took us all the way to Ornos (where we stayed) for 20euros. Usually our travel by taxi was 10euros between the Mykonos town and our hotel in Ornos. There is a bus that operates as well and one-way ticket is only 1,80euros but the schedule varies and the bus will most likely be at least 15minutes late. I do recommend it but prepare to wait. My first choice was to look for apartments on AirBnb and there is some amazing deals there but you might actually get a better deal by staying in a boutique hotel. We stayed in a family-run boutique hotel that included breakfast and the staff was very helpful. Customer service and people in Mykonos seem to be very friendly in general. There is a lot of family-owned boutique hotels in the island so with a little research I'm pretty sure you will find a great place to stay. 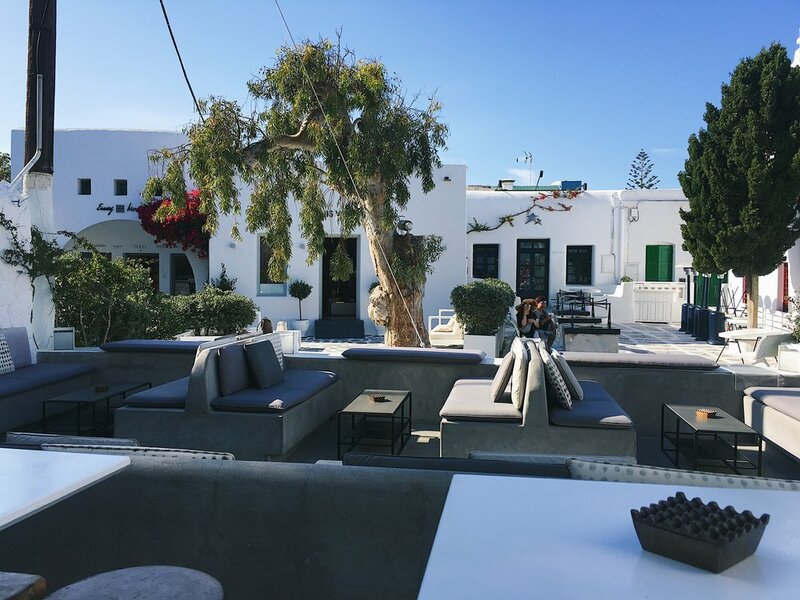 We were happy to stay in Ornos which is about 10minute car ride away from Mykonos Town, or you could even walk by the beach and make it there in 30minutes. I didn't try that myself but heard that it is a fun option as well, just have a hat and water with you to deal with the heat. It wasn't a problem to commute from Ornos but we were relying on public transportation and the bus tour services so we had to go to Mykonos Town at first if we wanted to go anywhere else in the island so if you are in that situation you might want to stay in town. It is very common to rent a car, a scooter or and ATV though and a lot of tourists do that so if that's what you are going to do then it doesn't really matter where you stay as the island isn't that big. I did not do that but if you do, just make sure the rental place has good reviews. You don't want your ATV to break down etc. Also, everybody seems to say that Mykonos doesn't have that many taxis so it's hard to get one. I personally had never an issue getting a taxi on-the-go or even when I asked a hotel to order one for me. Could've been the fact that it was off-season still but it wasn't never a problem. Okay so food... was a disappointment for me here! But then again I am a vegan and I couldn't really experience the lamb or octopus dishes that others would rave about. Also I had just gotten spoiled with daily fresh fruits and salads in Bali a month ago so that's where my disappointment might be coming from... but! I did score a few gems! : Our hotel offered a breakfast so we usually had that. I personally went for some bread with cucumber and tomatoes as there wasn't really a (vegan)choice. I bought an almond milk from a store to have with the cereal they offered. Some days they had bananas and oranges, some days they had canned peaches. The juice offered was usually heavily from concentrate or watered down. But I was talking with one restaurant owner in Mykonos and she told me that since the demand isn't always guaranteed and the taxes are quite high, they try to stretch the penny to make more profit. What was also very common to happen was that a few of the menu items couldn't be made. Usually the staff would inform you beforehand or when you try to order something. : So now to the good stuff! It is easy to be vegetarian, each menu will always have at least one option. For vegan... there could be a challenge. Usually ordering the salad or asking for pasta with no cream should do. 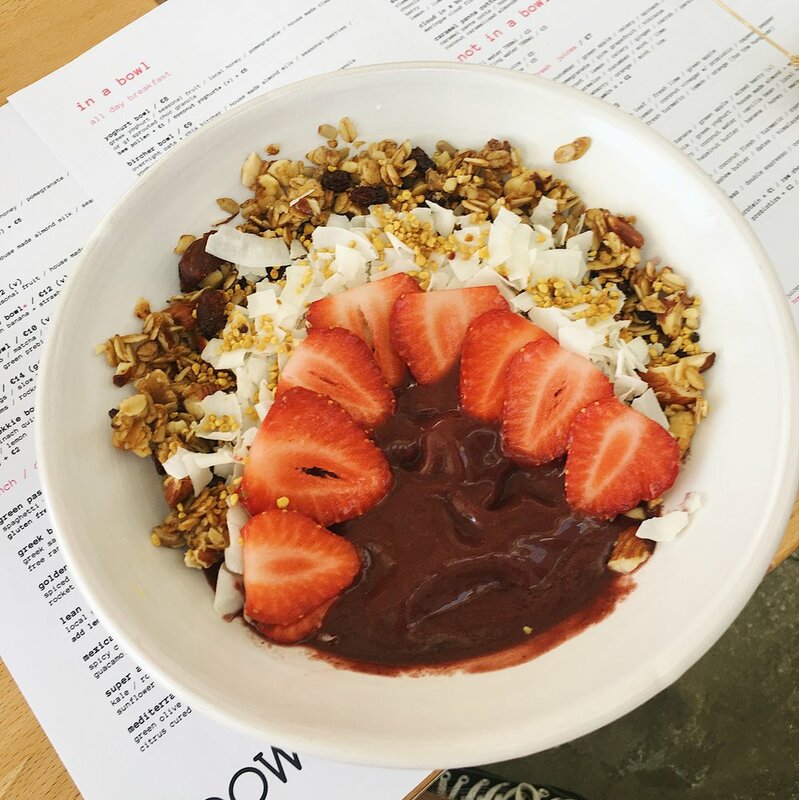 Smoothie bowls, vegan/vegetarian and gluten free lunch and dinner options! Adorable interior and good flavours. The food is mostly organic and fresh. I went there couple of times and I can definitely recommend it. Also a selection of specialty coffees. - So this one is directly on the beach, which you can instantly notice in the menu pricing. This is the place to have sushi with black rice if you feel like trying something new. I didn't go for it as there was no vegetarian option but oh my god their salads!! Huge portions and a lot of flavour. I also tried a pasta there and really liked it. For example if you order something like a pesto pasta, just ask for no dairy and you should be good to go. - I'll admit that I allowed myself to have some cheese during this trip as traveling with two meat eating guys had some dietary disagreements. However I might've went to three different pizza places total during my week long stay and I was never disappointed. The crust was always so tasty and the pizza itself, just so good. So even if you are on a budget, I don't think you will be disappointed. Mykonos also has their own cheese and almost any restaurant has a dish with it and it is worth a try. - Just the perfect snack during hot weather if you just happend to find it when exploring the Mykonos Town labyrinth like streets. And super delicious dairy-free chocolate sorbet! Check the beaches! There will be a party and there will be a lot going on. Also many bars seem to offer free shots when you first come in, so depending how good your tolerance, take it if you want to but you might wish to be cautious. They really don't seem to water down the alcohol. If you order a gin & tonic, yes you will get mostly gin for sure. So getting a black out drunk shouldn't be a problem but I personally tried to stick to wine haha. Also on the beach, all kinds of salesmen might try to hussle you by taking your picture, then charging for it, selling sandals and bags or what else. I can't even imagine how it is when it's the season. About the beaches. Paradise beach, it's OK. Ornos beach, loved it. Super Paradise Beach, loved it too and the Jackie'O bar/club right next to it. Of course there is more beaches but I only experienced those three. - Get lost in Mykonos Town. You will find yourself in Little Venice maybe during dinner but definitely go exploring the town itself if you didn't plan to shop in all the boutiques. There is some luxury brands stores but also a lot of stores with clothes made in Greece etc. Oh and don't wear high heels to town. Your feet will hurt. I don't know what was I thinking but definitely stick to sandals or sneakers. - Take a Sunset Yoga class I didn't have the time to try it but just hinting that this one exists and it seems amazing. A day before our flight we took the ferry back from Mykonos to Rafina and then had a hotel in a close-by neighborhood Mati. It was 8euros for the ride. Reason why we stayed there was because we arrived late in the evening and then had to fly out at 10am. The taxi from Mati to the airport was only 25euros and the driver didn't even charge extra for us to stop by an ATM on our way to draw cash to pay for the taxi. Yes, bring cash with you as many businesses only accept it and/or prefer it. I don't know how we paid double on our way to Rafina, maybe it was that Mati is right by an highway so it's an easy access or what but... oh well! Safe travels! If you've been to Mykonos before and have any recommendations, let us all know in the comments!